I have never seen so many people in one neighborhood work together to help rescue a cat. First, I got a call from Jane to see if I could help. It was too late in the day to rescue the cat that day, but I promised to do so in the morning. In the morning, I got a call from another neighbor, Amy, to let me know that the cat was still there and to see when I could come. 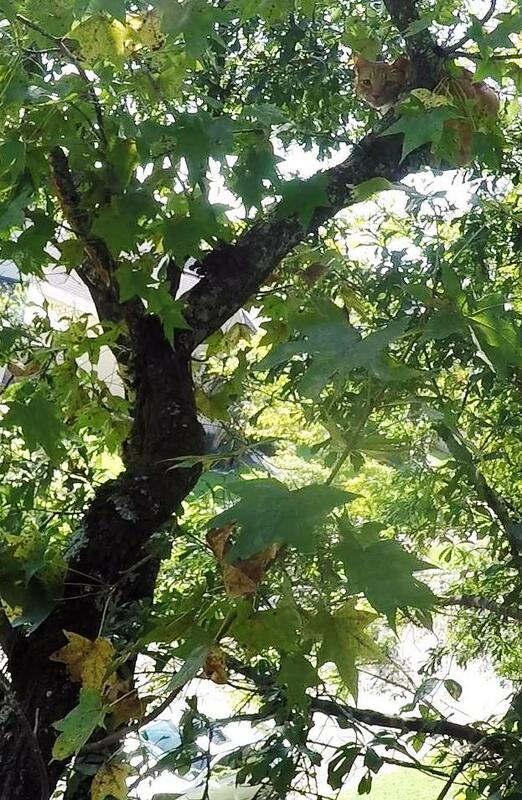 Just before I could leave, I got another call from another person, Allison, to report a cat stuck in a tree. At first, I thought she was reporting a different cat, but as we talked, we realized that this was the same cat. Allison just did not know that her other neighbors had already reported it. 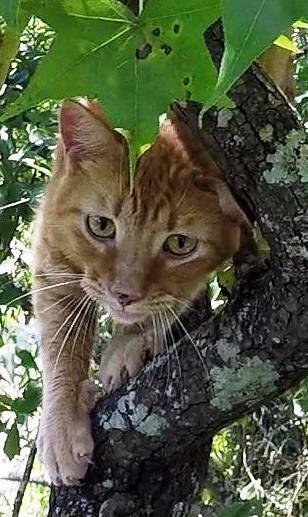 Many other neighbors had noticed the cat in the tree while they walked by and were also concerned. 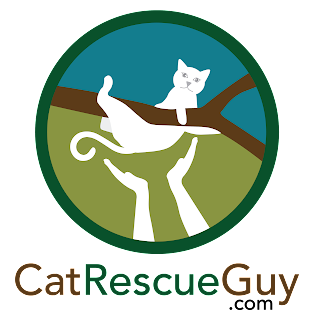 Some had banded together to try to rescue the cat themselves the day before. They called the fire department, tried a ladder and even rigged an "elevator" to pull up to the cat, but all their valiant rescue efforts failed. 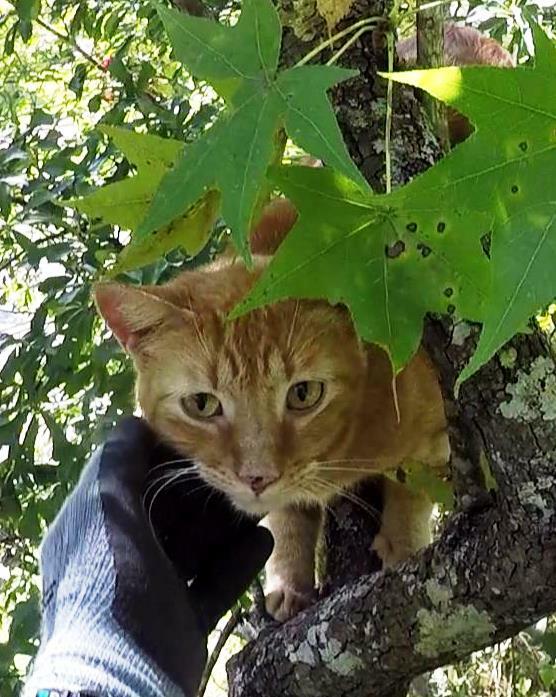 With so many people involved and concerned, it was no surprise to me that several of the neighbors gathered at the site where this cat was stuck in a tree while I began to work. As people would pass by, they noticed the activity there and stopped to chat with their neighbors and check on the cat. The cat was an orange tabby boy named Tanaka (ta-NA-ka). 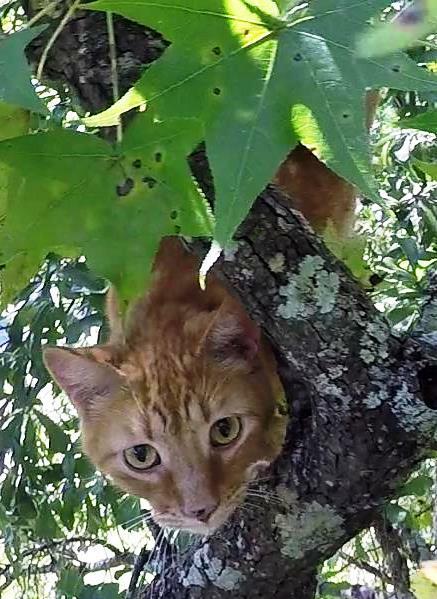 He was stuck about 25 feet high in a fairly large sweet gum tree directly across the street from his house, and this was his third day in the tree. The tree was in a narrow strip of wild area along the fence line marking the boundary to a park. To get my line in the tree, I had to shoot it into the tree from the street side and then walk a fair distance to the gate in the fence to get to the other side. I had to shoot my line into the tree three times before hitting my target, and that activity frightened Tanaka slightly causing him to walk about 10 feet out on a branch on the other side of the tree. I was glad that he did not go up any higher. From what I had learned about Tanaka, I was somewhat hopeful that he would be a cooperative cat, but once I climbed up to his branch, it became clear that he was going to be very cautious and not trust me. I tried to entice him closer to me with food, but, while I could see he was interested in the food, he had no intention of eating any. I put the food on a pole to hold it closer to him so that he would feel safer eating it at a safe distance from me. Each time I placed the food close to him, he backed off slightly. Surprisingly, however, he began rubbing his face on the end of the pole. This was a good sign. Now I knew there was a good chance that he would let me touch him if I could get close enough to him. If he allowed that, then I could scruff him into the cat bag. I tied another rope to the branch above us and used it to secure myself as I walked out on the branch closer to Tanaka. Once I was close enough, I reached out my hand to let him sniff it. He sniffed my hand and eventually let me touch his face. He was not interested in food, but he was certainly interested in some reassurance and affection. I spent a few minutes with him rubbing his head and ears and scratching his back, all of which he thoroughly enjoyed. He relaxed and began to trust me. When I had him well within reach, I scruffed him and pulled the bag over him. He never struggled or complained. I brought him down and handed him over the fence to his owner who was very happy and relieved to have him back down again. She took him inside where she released him and fed him. The neighbors were all so concerned, helpful, grateful and kind. They brought water out to me and offered to help me carry my gear. When I was in the tree and realized I had forgotten something, one of them retrieved it from my truck and brought it to me. They talked to all the other passing neighbors to let them know the status of the rescue. Such supportive people made my experience all the more enjoyable. Rescuing Tanaka was truly a neighborhood effort, and I am happy to have had a part in that.